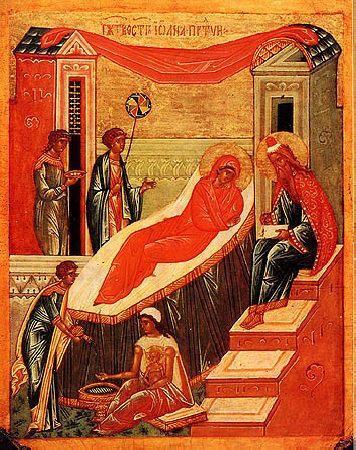 The Nativity of the Holy Forerunner and Baptist of the Lord, John: The Gospel (Lk. 1: 57-80) relates that the righteous parents of Saint John the Baptist – the Priest Zachariah and Elizabeth, lived in the ancient city of Hebron, and reached old age being childless, since Elizabeth was barren. One time, Saint Zachariah was making Divine services at the Jerusalem Temple and saw the Archangel Gabriel, standing on the right side of the incense offertory. He predicted, that Saint Zachariah would father a son, who would announce the Saviour – the Messiah, awaited by the Old Testament Church. Zachariah was troubled, and fear fell upon him. He had doubts that in old age it was possible to have a son, and he asked for a sign. And it was given to him – it appeared at the same time as a chastisement for his unbelief: Zachariah was struck speechless until the time of the fulfillment of the archangel's words. Saint Elizabeth came to be with child, and fearing derision over the lateness of her pregnancy, she kept it secret for five months, until there came visiting her distant relative the All-Blessed Virgin Mary, to share with her Her own joy. Elizabeth, at the prompting of the Holy Spirit, was the first to greet the Virgin Mary as the Mother of God. And together with her Saint John also – in the womb of his mother Righteous Elizabeth – did greet "with leaps as in song" the MostHoly Virgin Mary and the Son of God incarnated within Her. It became time, and Saint Elizabeth gave birth to a son, and all the relatives and acquaintances rejoiced together with her. On the eighth day, in accord with the law of Moses, was made the circumcision. His mother named him John. Everyone was amazed, since no one in their family had been named such. When they asked Saint Zachariah about this, he motioned for a tablet and wrote on it: "John is his name" – and immediately the binding of his tongue at the prediction of the archangel was unbound, and Saint Zachariah, at the prompting of the Holy Spirit, glorified God and pronounced the words of prophecy about the Advent-Coming into the world of the Messiah, and about his own son John – the Forerunner of the Lord. After the Nativity of our Lord Jesus Christ and the worship of the shepherds and the Magi, wicked king Herod gave orders to kill all the infants. Hearing about this, Saint Elizabeth fled into the wilderness and hid in a cave. Saint Zachariah as a priest was at Jerusalem and was doing his priestly service in the Temple. Herod sent soldiers to him to find out the abode of the infant John and his mother. Zachariah answered, that their whereabouts were unknown to him, and he was killed right there in the Temple. Righteous Elizabeth continued to live in the wilderness with her son and she died there. The lad John, protected by an Angel, dwelt in the wilderness until such time, when he came preaching about repentance and was himself vouchsafed worthy to baptise the Lord Who was come into the world.